Make everyday a laughfest with this set of seven classic tricks, pranks and practical jokes. 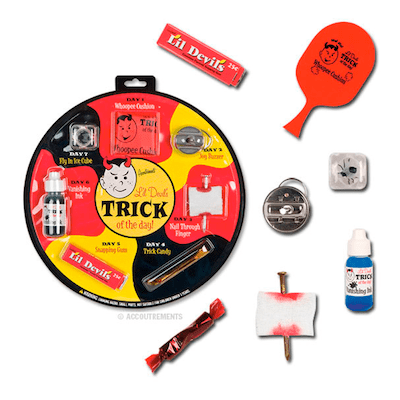 Each set includes a Whoopee Cushion, a Joy Buzzer, a Nail Through Finger trick, a piece of Trick Candy, a pack of Snapping Gum, a vial of Vanishing Ink and a Fly in the Ice Cube trick. Perfect for conniving children or nostalgic adults.